South Shore Waterfront Suttons Bay in the Walk Zone - nothing better! This cottage is darling.second home - furnishings available. This is a hard sand bottom and beach, large useable yard. Municipal sewer and water.... so easy! 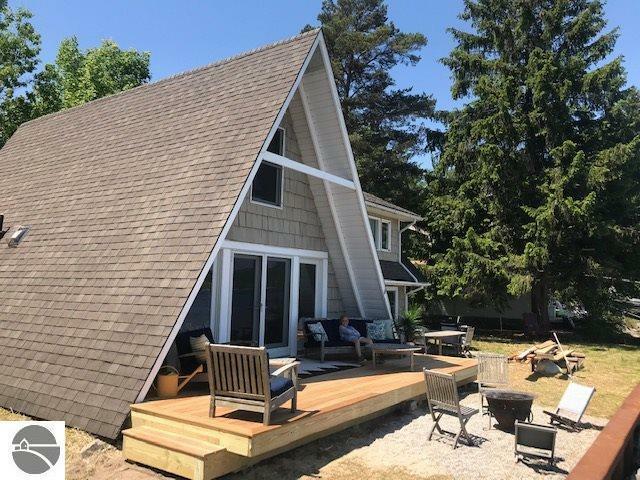 Best address in the Village - Hard sand bottom is amazing.... Open floor plan and separation of bedrooms, so bring the family and friends, boat, bikes, yoga mat, and stake your place in the most desirable location in the Village. Quality of life counts and this summer cottage is simply the best! Bedroom 1 Size: 15'9" x 9'10"
Br2 Size: 14'10 x 10'2"
Br3 Size: 11'5" x 8'2"
Br4 Size: 8'5" x 8'2"
Fam Rm Size: 16'10" x 14'6"
Liv Rm Size: 9'5" x 14'4"
Waterfront: Priv Frontage (Wtr Side), Sandy Bottom, Bay View, Yes, 106 Ft.